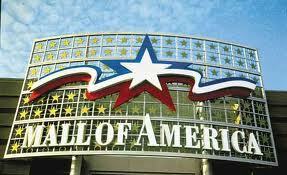 There's nothing like a trip to the Mall of America on a Saturday to check the sensory issues. Yesterday we took the kids to the Mall of America, and I was hyperaware of all the sensory stuff going on in there. It's brimming with people in early November -- all the Christmas decor is up and the shoppers are out in masses. Not that we were surprised. 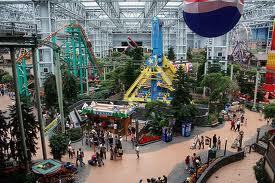 But sensory-wise, behavior-wise, the boys do pretty well at the Mall of America, because the thing about that place is, even if it's crowded, it's huge enough to handle a crowd. The hallways are gigantic, the ceilings are crazy high, so even if it's packed with shoppers and mall-walkers and people watchers, you don't really feel claustrophobic in there. It's almost like being outside. We thought we'd check out the brand new Microsoft store and here's where we were stupid, because, duh -- if we thought the rest of the mall was packed, of course the newest, hottest store was going to be buzzing like a bee hive. It's like there were rock stars in there or something, you could hardly get near it. Then we found out later that Kelly Clarkson was coming to promote the new store, so it wasn't just LIKE there were rock stars. There were. If you consider Kelly Clarkson a rock star. So naturally when we got wind of the crowds, we steered clear. Next we passed by a store that just sold model trains and accessories for trains -- it was the coolest. It was also pretty jammed but it didn't look like it would be impossible to get a double stroller in there, so we went for it. And both boys enjoyed watching the toy trains toodle along on their tracks for a few minutes. Like a couple of regular old 5 year olds. Since you sometimes end up waiting awhile for an elevator, we figured we ought to head up to the food court and get our McDonalds and find a free table before it got any closer to lunchtime. This is something else we've done with the boys a few times, and they love sitting up there over Nickelodeon Universe, watching everything that goes on down there while they munch on chicken nuggets. They don't love to walk around in Nickelodeon Universe -- but they do enjoy looking at it from afar. After lunch we just walked a bit, the boys taking turns walking and riding in the stroller, and though the people were thick and the noise level was aggravating, they both tolerated it so well. Even when we walked by an area where a group of dancers were performing to a percussion group (i.e., a lot of drums! ), they walked by without incident. I was so proud of them. After a quick walk through the American Girl store (as no trip to the MOA is complete without that, if Aliza is along), we were out of there, utterly proud of how great the boys behaved the whole time. Generally, outings with the boys last an hour, maybe an hour and a half if things are going particularly well. Saturday, though, they stayed happily at the mall with us for over 2 hours! A very huge accomplishment. Sunday we went to Nana & Grandpa's house for a little rest, relaxation, and football. Here are some photos especially for Nana, since she wasn't there. Jocelyn kept asking where Nana was, and saying Nana had gone "bye bye." We missed her, but I am pretty sure she's having a great time visiting her cousins! I love this picture of Zack! Going for a stroll in daddy's shoes. P.S, for anyone who is keeping score -- no progress on getting Zack to take a sippy cup. Grandpa worked on him Sunday afternoon a little bit, but he's hanging tough. P.P.S., I thought I'd pretend I'm a pro and put the blog name on some of these photos, but it takes for-ev-er to edit and save them with the name on there, so I'm not going to bother with it. Just please don't steal my pictures! What a successful Saturday! Hooray! And I did the same thing with pictures this summer, giving up after one post. See you tomorrow! Having a child with special needs does change your perception of the world. I hear the refrigerator kick on and in the beginning I always felt sad about how much louder that sounds through hearing aids. I'm so glad you go to enjoy a wildly busy place as a family! I might have to head out that way, we're American Girl doll crazed.